Home > Blog > Christine's garden > Good, bad or just ugly? Good, bad or just ugly? To be totally honest, I think its sort of beautiful. Interesting, different and alive. And I stood staring at it in awe for a while, took the photos and only after downloading them to my computer and really examining it in detail did it occur to me that this may not be interesting or beautiful at all, and that I might need to do something about it. Is there something wrong with the tree? I’d really appreciate advice and opinions on this. Do I leave it and enjoy it or is it some horrible I have to deal with? My sincere thanks to everybody who has commented on this post. You have helped me a lot. I’m very sad about this because I do love the tree and it seems it may need to go. I will do a follow up post once I’ve had someone take a look at it. Looking at all my “before” photos I took … well I know who damaged the tree that way that lead to the “infection”. So right now I’m angry and upset and want to calm down about it before I post and react to this – but I will in due course. I had these on my ficus tree. I thought they were beautiful but they were also an indication that my ficus was dying. I have to agree with Alan. It looks like the tree has been hacked and the area is now open to “infection” by fungus growth. But when your tree guys come again, I would ask them. Keep me posted. I hope this is not a major fav tree. I can’t help you diagnose the problem but I agree that it is quite beautiful, even if it isn’t what is “right” for the tree or the garden. Good luck with it! I agree. It doesn’t look good. Interesting, but not good. Was it you, or Barbie, who was waiting for the tree surgeon in May? Looks as if someone, or winter weather, once tore a branch off. The fungus is not the problem per say, that is just opportunistic I think. It is the original damage to the tree. If it were here, the likely culprit would be sun scald where the tree in winter heats up too fast on one side only and the bark splits and exposes the interior. But you said full shade and I I see this a remaining wet for too long on rotting wood, allowing the fungus to take hold. I agree with Clare and her assessment also. Beautiful, yes! I love mushrooms and other fungus. Is it something you may need to do something about? Do you like that tree and want it to be around for several more years? If so, then I’d have an arborist take a look. I’ve only seen fungus growing on trees that are on the way out — they have some dead parts on them or inside them that the fungus is feeding upon. I *think* I’ve read that fungus on the outside or at the base of trees indicates decay *inside* the tree. It may be nothing to worry about, but I’d ask a professional! I can’t tell for certain, but it looks like it might be some sort of ‘turkey tail’ fungus (Trametes versicolor is our local species here). It’s my understanding that as it targets rotting wood that its presence on a living tree suggests that the tree is in declining health. We find Trametes on our diseased oaks here. 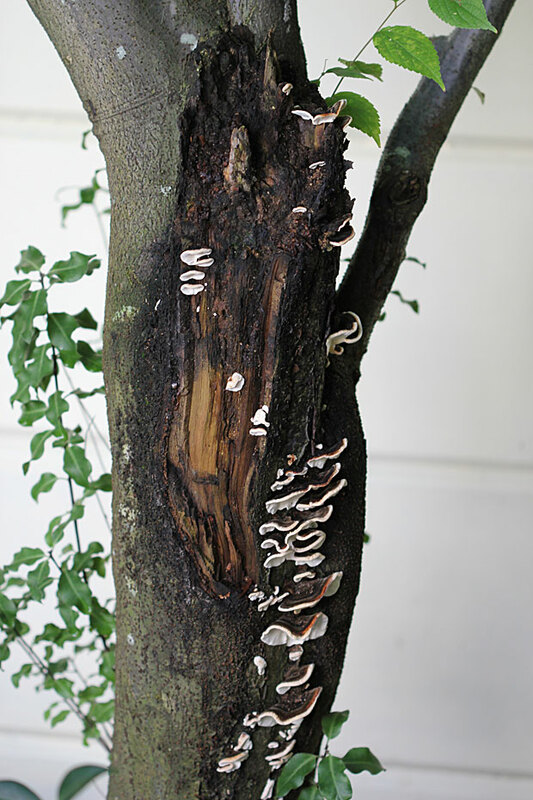 If it’s a tree that’s valuable to you, I’d recommend consulting with a certified arborist, both to positively identify the fungus, and for recommendations regarding any necessary treatment or pruning to improve its health. It does look as though that tree has sustained some past injury to the bark, a snapped branched perhaps. Good luck! I fear I can’t help with identification, but I agree that the lichen is both beautiful and worrisome. Good luck getting some answers!